From pediatrics to geriatrics and everything in between, the employment landscape for nurse practitioners is thriving. 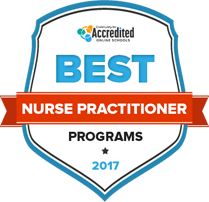 According to the American Association of Colleges of Nursing, nurse practitioners (NPs) are the largest subsection of the advanced practice registered nursing field. In this guide, readers learn how nurse practitioners are prepared for the workforce, including the educational opportunities available to them, the patient populations they can specialize in, and the steps towards earning a nurse practitioner certification. Students who aspire to become a nurse practitioner must first complete a graduate-level program in this specialization. Whether students are interested in becoming a nurse practitioner with a specialization in neonatal nursing, psychiatric nursing, or oncological nursing, they still have to make the first major decision of studying in a graduate program: which school to attend. Fortunately, we’ve made this part easy by looking at what each school has to offer in terms of cost for tuition, acceptance rate, and total student population, and putting together a ranked list of our findings. Check out the top nurse practitioner schools and programs for 2017 below. The following illustrates a potential degree path for aspiring nurse practitioners. After completing an undergraduate degree, students have the option to work as an RN or go straight into their graduate-level studies. Earn an associate degree in nursing (ADN) or bachelors of science in nursing (BSN). Pass the NCLEX-RN and state licensure (optional). Begin working as a registered nurse at a hospital, clinic, or other healthcare facility (optional). Purse a master’s degree in nursing (MSN) or a doctorate degree (DNP), depending on your professional aspirations. If not already a licensed nurse, pass the NCLEX-RN. Then earn certification as a nurse practitioner through the American Nurses Credentialing Center or the American Academy of Nurse Practitioners. The American Association of Colleges of Nursing reports that there are more than 2,000 graduate degree programs around the country, which gives nurses a wealth of options for enrollment. The following search tool can help users sort through the many nursing degree programs out there, allowing them to find the school that best suits their needs and career goals. Just as there is more than one nursing school or degree program available to students, there is also more than one path to becoming a nurse practitioner. In some cases, students begin their education with an associate degree in nursing (ADN) and then move on to a bachelor’s degree and become a registered nurse. After getting past the undergraduate level, nurse practitioners are required to earn advanced degrees, so they will continue their education by earning a master’s degree and then a doctorate if desired. In other cases, nurses make the decision to skip earning an associate degree and immediately work toward getting a bachelor’s. Some may work in the field for a while before deciding that they want to advance their careers and education, while others go straight to graduate school after completing their undergraduate degree with an eye toward becoming a nurse practitioner. No matter which educational path students choose, the following sections outline what they can expect during each stage of the process. Students can begin their careers after earning an undergraduate degree in nursing. These programs expose students to the nursing field, giving them the knowledge and training they need to obtain an entry-level nursing job. They also provide the academic foundation necessary for students to further their education so they are well-prepared to move on to a nurse practitioner degree program. Associate degree programs in nursing are an excellent way for students to learn the basics of the profession and get hands-on training that will move them toward a rewarding career. The curriculum of these programs generally covers subjects such as pharmacology, physical patient assessments, pediatric nursing, mental health nursing, nutrition and anatomy and physiology. In addition to classroom coursework, ADN programs also provide experiential learning opportunities where students see firsthand how nursing concepts are applied to real-world patient care. This component can include required laboratory experience that accompanies classwork, as well as training in internship programs. For more information on this degree, visit our detailed ADN page. On the bachelor’s level, students gain a deeper understanding of the nursing field and its concepts, whether they are building on the education they received at the associate’s level or entering nursing education for the first time. Students in these programs may take courses in maternity and pediatric nursing, public health, emergency care, genetics, nursing research and professional ethics for nurses. Armed with a strong understanding of nursing theory, students in BSN programs get the preparation they need to practice through hands-on training. Nursing schools emphasize experiential learning as much as textbook studies, so future nurses actually find out what it feels like to apply nursing concepts to the special needs of individual patients. Master’s degree programs in nursing accommodate the career and educational needs of students from various backgrounds who all have the same goal: training to eventually pursue an advanced nursing position. Entry-level master’s degree programs are for those who want to become a nurse after earning a bachelor’s degree in another discipline, while RN to master’s degree programs are designed for practicing nurses who have earned an associate’s degree. Likewise, there are degree programs specifically geared toward nurses who have completed their bachelor’s degrees. No matter where they come from educationally, MSN students all get the advanced skills and knowledge they need to move up the career ladder. Some students use this experience to get a job right after graduation, while others will continue on the road to eventually completing a nursing doctoral program. For more information on this degree, visit our detailed MSN page. The American Association of Nurse Practitioners (AANP) began discussions in 2001 to determine if a doctorate-level degree should be required for nurse practitioners in order to meet the rigors of advanced nursing. As it stands now, the majority of NP programs award students with a master’s degree, although there is still a push to make the doctor of nursing practice (DNP) degree the minimum requirement for nurse practitioners. Who should earn a doctorate? Doctorates should be earned by nurses who want to advance in their careers. Whether they want to become advanced practical nurses, researchers, or professors, these programs are designed to help students meet their goals. Doctoral degrees usually take about four to six years to complete. What are the admission requirements for a nursing doctoral program? Doctoral programs require that students have at least a bachelor’s degree from an accredited school. In addition, applicant must submit their GRE scores, maintain a certain GPA, and hold a current nursing license. What skills can doctoral students learn? Health care technology is rapidly evolving, so it’s imperative that nurses keep abreast of the latest technologies and have a deep understanding of how these advancements work. Students in doctoral degrees are taught about the latest technologies and how they can be used to care for patients. Nurse practitioners must be able to apply their knowledge to individual patients. Critical thinking skills are required to make the right decisions for patient care based on evidence-based research. Students who are interested in advancing knowledge of the field gain the research skills they need in a doctoral program. These programs teach students the different research methods that are used, how data is collected and analyzed, and strategies for communicating research results. Patient care is a team effort, and in order to ensure that patients have positive health outcomes, each member of the team must know how to work effectively with one another. Students in doctoral degree programs get advanced experience working in a team, and learn the best practices for effective teamwork. Many students earn advanced degrees with an eye toward obtaining managerial positions. These students can study leadership styles, finance, the legal and ethical concepts that health care managers need to know, and how to deal with workplace conflict. Nurse practitioners receive a lot of training that make them an invaluable part of the health care field. As a result, these professionals are able to use their advanced skills and knowledge of nursing to concentrate on a specific patient population. The following are examples of concentrations that nurse practitioners can pursue. These professionals are responsible for the treatment of patients with mental illnesses, such as depression. This concentration entails diagnosing mental illnesses, providing therapy, and helping patients’ families as they struggle with their loved one’s condition. Neonatal nurse practitioners treat sick babies, as well as those who have been born prematurely. The patients they work with may have respiratory problems, low birth weight, or heart defects. Their work includes monitoring incubators and ventilators, administering medication, and performing tests to make a diagnosis on a sick child. In addition, these nurse practitioners may educate families on how to care for their children after they’ve been released from the hospital. ER nurse practitioners work with different kinds of patients who are receiving emergency room care. This job entails ordering scans, lab work, and X-rays; prescribing pain medications; and monitoring patients who are in an unstable condition. These nurse practitioners focus their practice on elderly patients who may be treated in nursing homes, hospice facilities and health care clinics. Gerontological nurse practitioners’ job duties include conducting examinations to provide diagnoses, prescribing medications, ordering laboratory tests, and advising preventive care strategies. Oncology nurse practitioners work with patients who are being treated for cancer. They can be found in several medical settings, such as doctor’s offices, cancer centers, and hospices. The job duties of oncology nurses has grown exponentially over the years, so now these professionals are involved in an array of medical services, such as screenings, radiation therapy and chemotherapy. After completing a graduate-level degree program and passing the NCLEX-RN, the last step in becoming a nurse practitioner is undergoing the certification process. Certifications are issued through the American Nurses Credentialing Center and the American Academy of Nurse Practitioners. In order to become certified, nurses must meet the eligibility requirements, which include having a graduate degree, a current license, and a certain number of clinical work hours. Once those requirements are met, professionals must then pass an examination. When nurse practitioners seek a professional credential, they need to choose an area of specialization to demonstrate their expertise in a specific part of the field. For example, the ANCC has several available specification areas, including family, gerontology, psychiatric-mental health, pediatric and school nurse practitioner credentials. Similarly, the AANP has adult, gerontology, and family nurse practitioner certifications available. Nurse practitioner certifications must be renewed every five years. Just as they did when they initially applied for their credential, nurses are required to meet certain standards when they are up for renewal. The credentialing organizations generally require that nurses complete a certain number of clinical hours and continuing education courses designed to keep their knowledge and skills current. In addition, nurse practitioners may be required to pass another examination. Submit fingerprints in order to undergo a criminal background check. Register for and successfully complete the certification examination.